The Comma, family of Nymphalidae, is a common and widespread butterfly that flies in two generations between mid-May and early November. Males and females are alike. Butterflies of the second generation hibernate and from the first sunny days of February, the Comma leaves its shelter to feed. Its angular wings are orange with brown spots on the upper side. The underside is marbled with brown. Wings closed, the butterfly looks like a dead leaf and offers excellent camouflage. Polygonia, translated from Latin "which has several angles", refers to the very angular wings. 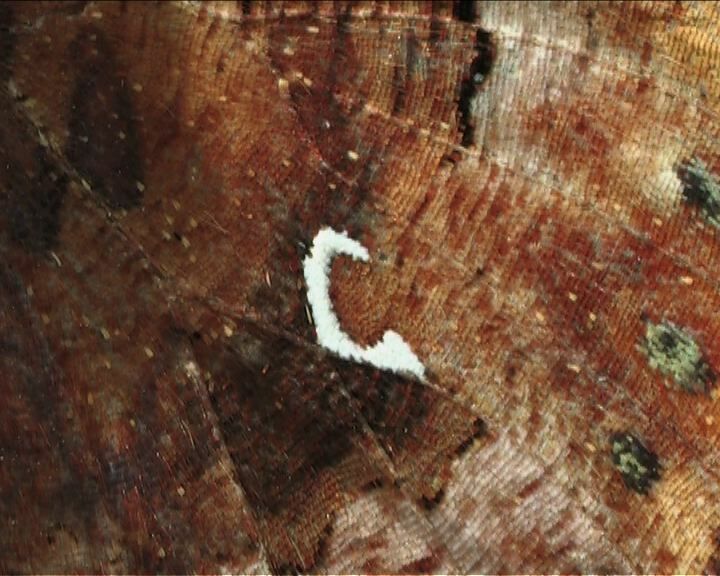 The small C-shaped white comma, on the underside of the wings, has given it the Latin name P. c-album and in English the name, Comma. The Latin C derives from the 3rd letter of the Greek alphabet "gamma" and "album" translated from Latin means white. In French this butterfly is named ‘le Gamma’. The Comma is attracted to the sap seeping from lesions in trees, as we see here on this willow where it forages generously. Like most overwintering species, the Comma appreciates ripe fruits in autumn and tries to store energy for the winter.